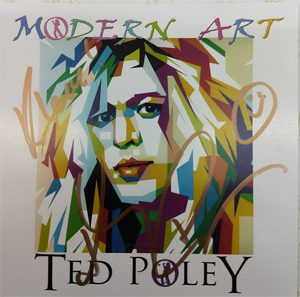 Ted Poley, the charismatic DANGER DANGER vocalist will have it's new album, Modern Art, released in a limited splatter vinyl, limited to 500 units, on 30th November 2018, via Mighty Music/Target group. The vinyl version was remixed by the Grammy-award producer Neil Kernon (DOKKEN, JUDAS PRIEST, NEVERMORE) and the LP is personally autographed by Ted Poley himself. Ted Poley is one of the most recognizable and hard working vocalists and drummers in the history of hard rock music. Despite the fact that his tenure with DANGER DANGER from 1987 to 1993 and from 2004 until today (with which he recorded seminal albums such as Danger Danger and Screw It! ), his vocal abilities are featured in several other bands such as BONE MACHINE, MELODICA and TOKYO MOTOR FIST. Since 2006, Poley also pursues a solo career, which granted him five full-length albums. Modern Art is the new one of this line and was recorded in Sweden with the band DEGREED serving as supporting musicians. The LP version of the album is released through Deko Music and will be exclusively distributed in Europe by Mighty Music/Target Group. Pre-orders available HERE.